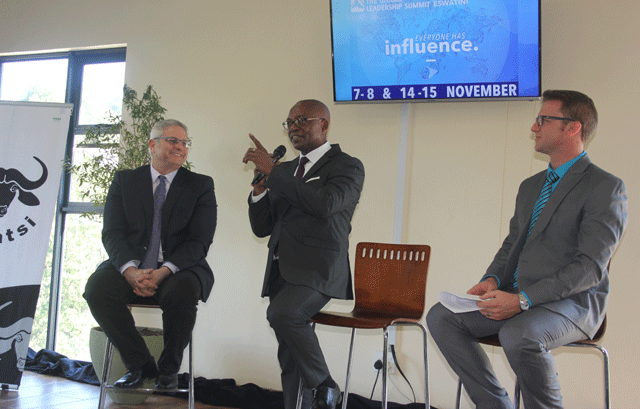 THE fourth global leadership summit (GLS) Eswatini is taking things up a notch this year, with world renowned speakers that will be at this year’s meeting which is themed ‘Everyone has influence’. The summit will be hosted by Potter’s Wheel Church on November 7-8 and 14-15. This was revealed by Leadership Partner Juan Dewet at the launch of this year’s GLS which was held at Potter’s Wheel Church yesterday. Dewet said GLS would help improve one’s leadership and impact in all spheres of influence. The two-day summit that is in its fourth year is bringing to the country leaders like Thuli Madonsela, who is former South Africa’s public protector, Horst Schulze, who is the CEO of Capella hotel group and founding president, the Ritz Carlton group, entrepreneur, digital thought leader and author. The conference will also have international keynote speakers like David Molapo, who is the founder and president of ICAN foundation and renowned motivational speaker. also part of the speakers will be Mamike Molapo, who is an inspirational speaker, educational and management consultant. Inyatsi Construction Contract Manager Sandile Mhlanga said GLS plays a significant role in their business as they believe in personal and professional growth of their employees. “Over the last year at Inyatsi, we have been focusing on succession planning. this summit provides a platform for our young leaders in the organisation to be prepared for the next level. We are proud to be part of this summit and urge the nation to attend the GLS,” he said. In addition, the summit will have video cast speakers who include Simon Sinek, who is a New York Times bestselling author and optimist. Rasmus Ankersen, an entrepreneur and a bestselling author. Other speakers will include Strive Masiyiwa, who is the founder and chairman of Econet group, Erwin McManus, who is also an author, futurist and founder of Mosaic in Los Angeles in the United States of America. Furthermore, the summit will have T.D Jakes, who is founder and Senior Pastor of The Potter’s House. Other speakers will include Craig Groeschel, who is a co-founder and Senior Pastor of Life Church. Other video cast speakers will include: john C Maxwell, who is a leadership expert and bestselling author and coach. Carla Harris will also be part of the speakers and he is the vice chairman, managing director and senior client advisor of Morgan Stanley of speakers.